Use Word's Quick Tables (Ribbon Versions of Word) and add your own to the list. Create a (continued) label in a header row for a table. View non-printing Gridlines when working with Tables. Know how to use Tabs and Tab Settings within a Table. Know how to Convert a Table to text or text to a Table. Use Cell properties to change text appearance within the cell. Using (Table) Borders in Microsoft Word - Run for the Border by Suzanne S. Barnhill, MVP. Why Don't My Table Borders Print? Changing table rules with compatibility options (KB) these can change how Word acts with tables. Insert logos /graphics on business cards and mailing labels by Graham Mayor, MVP. Everything from pleading captions to file indices to stock certificate listings can be managed in tables. In this chapter, we cover the basics first—how to create, modify, and prepare your tables for the legal environment. Next we'll look at some of the ways to make tables useful in your firm. You will also see a greater number of references to Word 2000 than in other chapters. This is because the Table feature in Word 2000 has been greatly enhanced to offer more functionality. The enhancements continued through Word 2019. You may prefer Table Basics (Ribbon) by Suzanne S. Barhill, MVP. You can use tables to align numbers in columns, and then sort and perform calculations on them. You can also use tables to create interesting page layouts and arrange text and graphics. 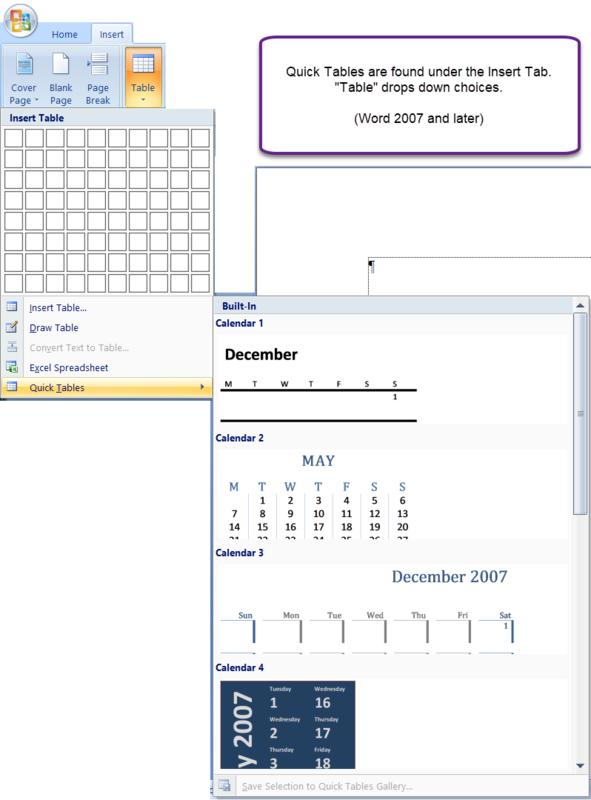 Drawing the table using the Tables and Borders toolbar tools (Word 2003 and earlier). Converting existing text not in a table to a table format by choosing Convert Text to Table from the Table menu. The Insert Table button on the Standard toolbar or Insert Tab is one of the fastest ways to insert a table in a document. If you click the button, a box extends below the button with smaller boxes inside. Move your mouse over the number of cells you'd like to insert into the document. Notice that the cells change color as you move the mouse over them. This indicates the size of the table to be created. When you have the desired number of cells selected, click to insert the table into the current location of the mouse pointer. In Word 2007 and later, you can also select a Quick Table using this button. Note You can increase the size of the table you insert. Hold down the left mouse button and drag farther down, to the right, or click the bottom right corner of the table and drag to increase both length and width of the table. The number of cells that can be inserted using this method is dependent on the size of your display, and the position of the Insert Table button on the toolbar. You can only select as far to the right as is visible on your monitor. CK Note: In the Word version of the Legal Users' Guide all Notes, Tips, and Warnings (with the little pictures) are contained in two-cell tables. Tip To increase the number of cells that can be selected using the Insert Table button you first need to reposition the button further to the left on the toolbar. Hold the ALT key, and drag the Insert Table button to a position to the left of the current location. 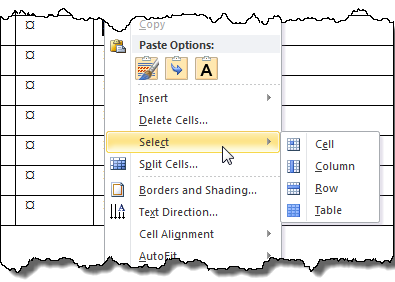 The Insert Table button is limited in how many cells it can display initially. When building a large or more complex table, you may find using the Table menu more useful. In Word 97, from the Table menu, choose Insert Table; in Word 2000-2003, from the Table menu, choose Insert, and then select Table. The Word 2000-2003 Insert Table dialog box is shown in the next figure. The Insert Table dialog box in both Word 97 and Word 2000 allows up to 63 columns and 32,767 rows in a table, but Word 2000 lets you exercise more formatting choices and allows you to set defaults for subsequent visits to the dialog box. Make sure you're on a blank line in your document. 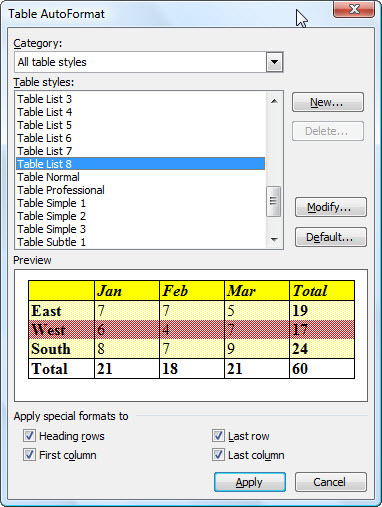 In Word 97, from the Table menu choose Insert Table. 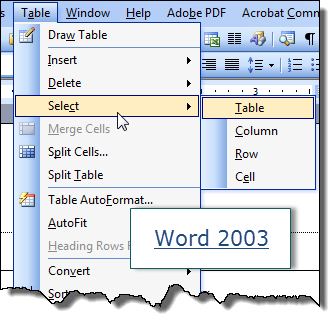 In Word 2000, from the Table menu choose Insert, then select Table. In the Number of columns box, type 100. Click OK. Note the error message (Both Word 97 and 2000 have a limit of 63 columns, no matter the paper size, orientation, etc.). In the Number of columns box, type 4. In the Number of rows box, type 100. If you need more than 63 columns or 32767 rows, consider using Microsoft Excel or Access, depending on the task. Note Microsoft Excel is a powerful spreadsheet program that includes functions for data analysis, database, and presentation. 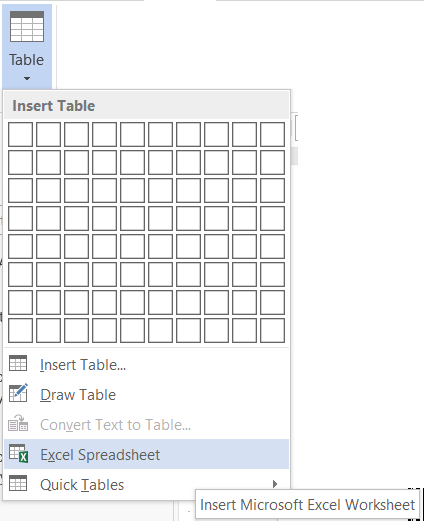 The entire Excel worksheet is like a very large table made up of cells. Microsoft Access is a relational database application that is easy to use for simple or complicated tasks. One of the most exciting things about Word is a feature called Draw Table. Draw Table allows you to create your own tables with special row and column dimensions to begin with—no more messy eyeballing your row and column sizes. To activate the table-drawing tool, click the Tables and Borders button on the Standard toolbar—the button resembles a pencil resting over a table. Notice that now you not only see the Tables and Borders toolbar if you couldn't before, but you can also click and drag with the mouse pointer in the document to create a table. Draw Table is a great feature for situations where a standard-sized table won't do: pleading captions are a perfect example. Let's draw one. On the Standard toolbar, click the Tables and Borders button. If you want to add the new toolbar near your menu bar instead of having it float over the document, you can "dock" it by double-clicking anywhere in the title bar that says "Tables and Borders." This gets the toolbar out of the way of your work and gives you more room to create and modify your table. Inside the middle of the table, click and drag from top to bottom. Repeat to create a very narrow column in the center of the table as shown in the next example. Tip To eliminate all of the printing borders in your table, place your cursor in the table and then press ALT+CTRL+U. Type your scallops in the middle column and you're on your way (scallops are created using the ")" key) and pressing ENTER multiple times. Your pleading caption probably still needs some touching up, but once you're finished, you could save this as an AutoText entry and never have to create a pleading caption again! If you accidentally lose the Draw Table tool on your mouse pointer, click the pencil button at the far left side of the Tables and Borders toolbar to reactivate it. Note To create an AutoText entry, select the text or object and then from the Insert menu choose AutoText, and then choose New. Type a unique name for the AutoText entry and click OK. If your AutoText name is less than four characters, or if the name applied is not unique, you will need to press F3 to complete the AutoText entry and place the text or object within the document at the current location. If the entry is four or more characters, after you type the fourth character, a ScreenTip appears as you type. Press TAB, F3, or ENTER to insert the AutoText entry. 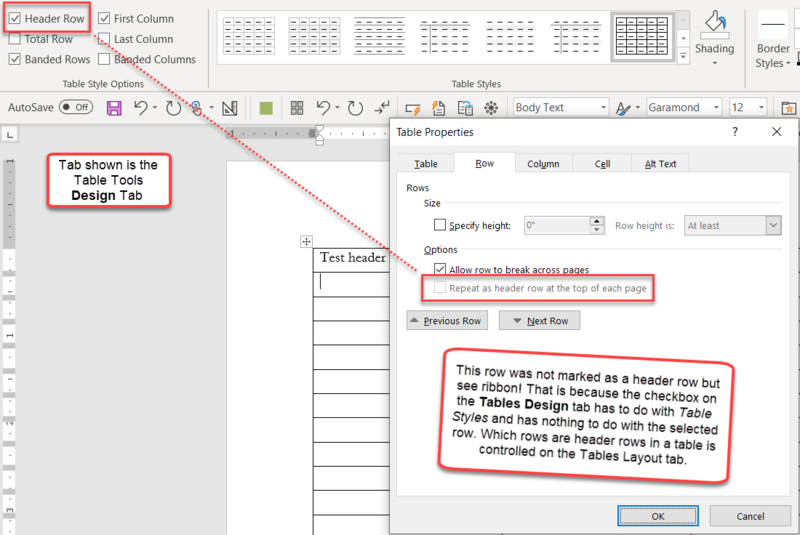 Note A new feature to Word 2000 is guidelines that appear on the ruler as you create the table (shown in the following figure). This provides a visual representation of the measurement of the table being created. Using the Text to Table feature under the Table menu. These methods are discussed further throughout the rest of this chapter. Help on each method to inserting a table into a document can be found in Help files in Word. If you have already created data in a tabular format in another application, there is a good chance that all you need to do to create a table with that data in Word is copy and paste. Make sure Word is open. Open the file in the other application that contains your tabular data. Select (if necessary) and copy the data from the source file. Note For most applications (and especially those in the Microsoft Office suite), this will be all you need to do. For others, a more complicated export procedure is required. See the Quick Tables section below. On the Tables and Borders click Draw Table. The pointer changes to a pencil. Position the pencil in the cell where you want the nested table (or a table inside another table). Draw the new table. To define the table boundaries, draw a rectangle. Then draw the column and row lines inside the rectangle. 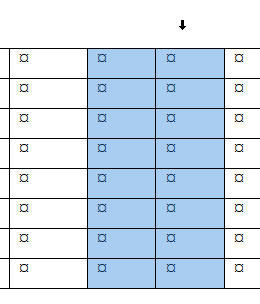 When you finish creating the nested table, click a cell, and start typing or insert a graphic. Using nested tables will make your document incompatible with Word 97. A nested table is a table within a table. You can follow the directions given above pretty much in Word 97 and create a good result. That is, you can use the pencil to draw new cells within an existing cell. What you can't do in Word 97 is create that second table outside of the first one and then copy or move it into the first table. The size of a table is dependent on information being added or removed from the table structure. To insert a row at the end of a table, press TAB while in the last cell of the table. You can also add a row or column in different locations within the table by accessing the Table or Shortcut menu (alternate click) while the mouse pointer is within the table. To insert or delete rows and columns, select what you want to affect—rows to affect rows, columns to affect columns—and then select the appropriate option from the Table menu (rows or columns). 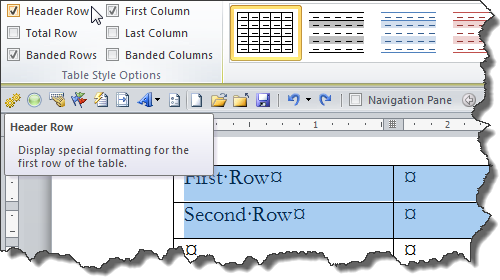 In Word 97, rows are inserted above the selected row(s), and columns to the left of a selected column(s). In Word 2000, you can define whether rows are inserted above or below the current row, and whether columns are inserted to the left or right of the current column. To change row or column height in a table, pause the mouse pointer over the border between two rows or columns and click and drag to alter the table structure. 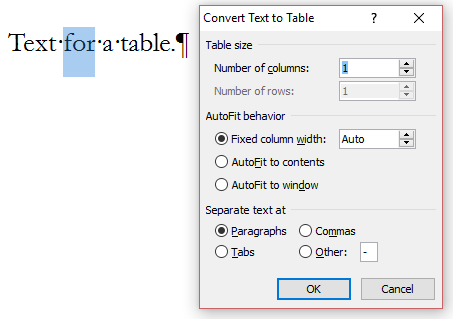 In Word 2000, tables act as drawing objects, which means you can use the drawing handle in the bottom right corner of the table to modify the table easily. Just click and drag. Tip You must be in Page Layout view (Print Layout in Word 2000) in order to change the height of a row by dragging the border. Tip In Word 2000+, if you click within a table, you'll see a move handle that allows you to click and drag the table to another place on the page. (See the following figure for an example of this new feature). 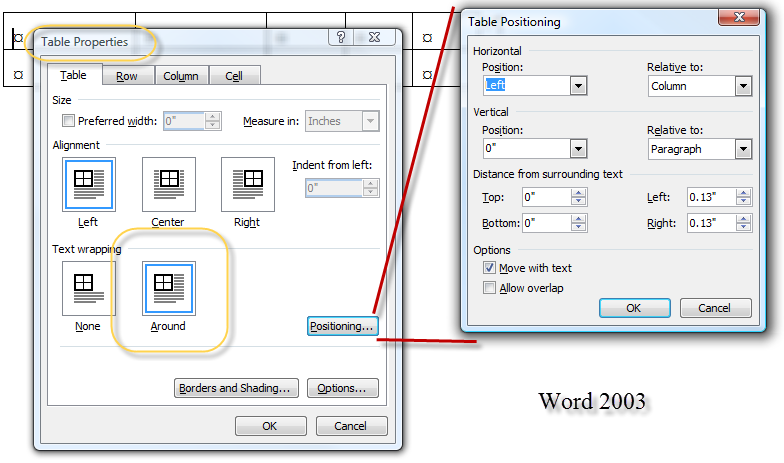 Word 2013 added another on-screen control to allow insertion of rows or columns. It is a plus sign in a circle at the beginning of a row or top of a column. 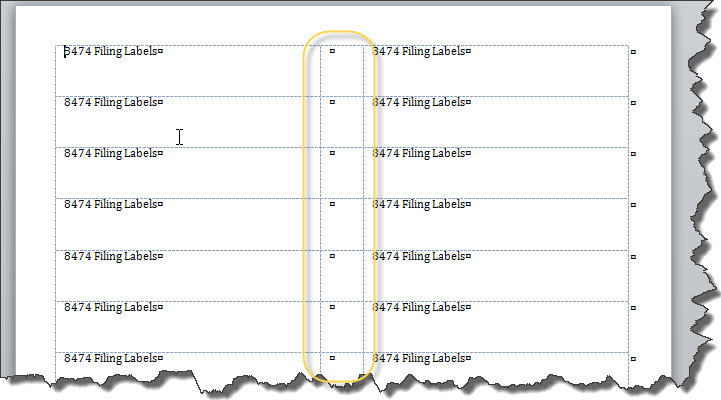 When active, it will put a slight division between rows/columns showing where the insertion will take place. Clicking on the plus sign inserts the number of rows/columns that were selected at the division mark. If you click on the + sign Word will insert a row or column where the divider shows in the table. If you have multiple rows or columns selected, it will insert the same number of rows or columns as you have selected. You can choose to view the Tables and Borders Ribbon by selecting it under the View Menu or by right-clicking on one of the docked toolbars at the top of the page. (Word 97-2003) They may be docked already at the top of your page (or along the side or at the bottom of the page). These Table ribbons are context ribbons. They become visible and active when you are in a table and are hidden when you are not. You can use any of the tools you normally would use to format text in tables. See Basic Formatting. Probably the best method, though, is to use Styles. 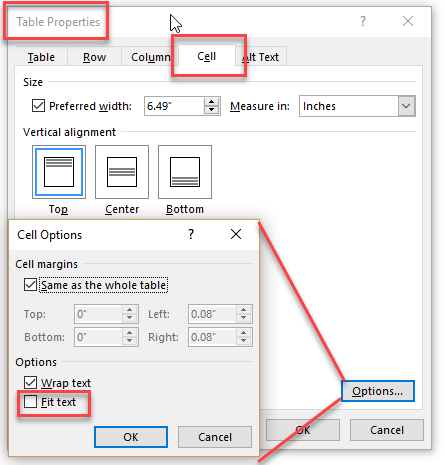 Text in selected cells can be aligned in any of nine directions using the alignment buttons on the Tables and Borders Toolbar or the Alignment group of the Table Layout Ribbon. 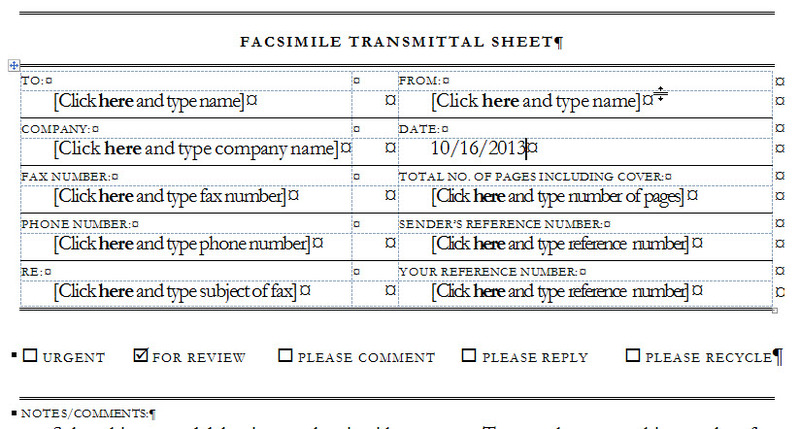 This is a form of direct formatting. Your author does not know much about Table Styles and they were introduced after the original chapter on Tables was written. You can see them in the Design Ribbon above; here is a screenshot from the Word 2010 Table Style Gallery. 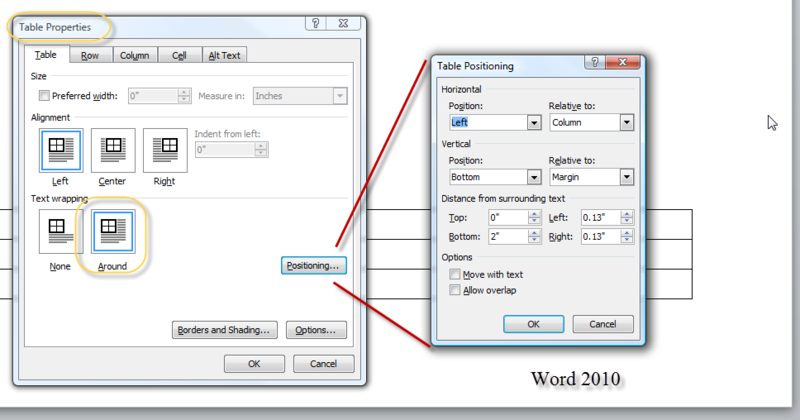 You can get many of these same built-in styles using the Table AutoFormat command in Word 97-2003 (on the Tables menu). Using either of these can allow you to make dramatic changes for better or worse to your table's appearance. Remember, UnDo is your friend! There are a number of operations you can do to selected parts of a table but first you have to select those parts! The most straightforward way is to click in one cell, hold the mouse button down, and click in a different cell. A rectagular section of your table will be selected. If you move your mouse pointer outside the table near the left edge of a row or top edge of a column, it becomes a superpointer. Clicking when that is active will select the row or column. The superpointer for a column is a small black arrow pointing down. That for rows is a right-pointing white arrow. If, after selecting one column or row, you hold the Shift key down, you can select one or more contiguous columns or rows. 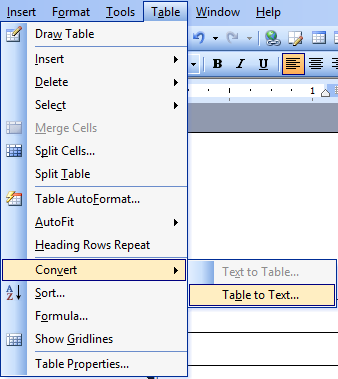 In Word 2007 and later, on the far left side of the Table Layout Tab there is a Select button you can use to select the Table, a Cell, a Row, or a Column. In Word 97-2003 there are Select commands under the Table Menu that allow this. In Word 2010 and later, you can also right-click in any cell and pick the Select command from the pop-up context menu. Once you have portions of a Table selected, you can apply formatting, copy, paste, and perform other operations on that portion. One of the key things you can do is to mark one or more rows as a "Header Row" for the table. This is something completely different from Headers and Footers for pages. Alt+5 (on the numeric keypad) Selects the entire table. Shift+Alt+PgDn to select entire column from the top cell. Shift+Alt+PgUp to select entire column from the bottom cell. The Backspace and Delete keys act on selected text to delete the preceding character (Backspace) or delete the following character (Delete). When text is selected, both will delete the selected text. However, in a Table when the table or cells are selected (rather than just text), they act differently. When you have a table, rows, columns, or cells selected, the Delete key will empty whatever you have selected, leaving the table structure intact. The backspace key will delete the structure as well. If a row is selected, it will be deleted and rows below will be shifted up. If a column is selected, it will be deleted and columns will be shifted to the left. If cells are selected, you will be prompted on what to do with the remaining cells. Tables often have header rows that describe what is in the columns underneath. When a table breaks across a page it is useful to have these header rows repeat. Documentation and tooltips talk about "the first" row, but multiple contiguous rows can be marked as the table header. They do need to be the first row(s) in the table, though. Select the row(s) at the top of the table that you want to repeat. Check the box to "Repeat as header row at the top of each page"
Note this may work in earlier versions than 2003 but does not work in Word 97. I believe this feature was introduced with Word 2000 but do not know for sure. Select the Row(s) you want to repeat across page breaks. On the right end of the Table Tools Layout Tab check the option to "Repeat Header Rows." Note, that there is on the Design Tab also a checkbox for header row. This is a design choice for picking a table style and has nothing to do with repeating on the next page. Final note, header rows do not work if you have a table set to have text wrap around it. It is easy to miss these Options which have been available at least since Word 2003. Wrap Text is checked by default and Fit text is unchecked by default. The table shown below has the top two cells set to fit text. The font typeface and size is the same in all three cells. The text in the top cell appears compressed. It is the same text as the first three sentences in the bottom cell. 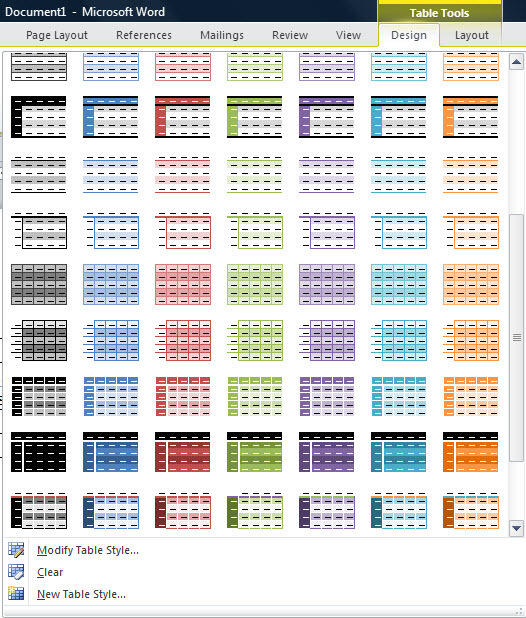 The ribbon versions of Word added a gallery of sample tables called Quick Tables. These are Building Blocks. Word 2007 and later come with nine built-in sample "quick" tables. Again, these are building blocks and come in the file Built-In Building Blocks.dotx in Word 2010 and later (Building Blocks.dotx in Word 2007). Unlike table styles, these are actual tables. The user can add their own table to the Table or Custom Table Quick Parts Gallery and have them show up in this menu. At the bottom of the Quick Tables dropdown you can see the command "Save Selection to Quick Tables Gallery. That command is active only if a table is currently selected when this drop-down is used. The name for your Quick Table. The tables will be listed in alphabetical order, within the category. The Gallery to store it in. If you want it to show up under Quick Tables, you must save it in the Tables Gallery. The Category. The tables appear in alphabetical order in their categories which also appear in alphabetical order. The default category is "General," which will appear after "Built-In" in the list. The category shown above is "_My Quick Tables" which would appear before either. The "Save in" Template to store the Quick Table. The dialog above shows Building Blocks,dotx which is the default. I recommend saving it in a different template if you want to share your quick table. See Where can Building Blocks be stored? * If you use the keyboard shortcut of Alt+F3 to reach the "Create New Building Block" dialog, the default gallery will be AutoText and the default save-in location will be the normal template. A "caption" is a label that appears with a Table. It can be sequentially numbered and automatically inserted with each Table if you wish. Insertion of captions is covered in the chapter on Complex Documents. If you need the caption to repeat you would need to put a cross-reference to it in the first row of the table and set that as a repeating table header row. That row need not have top or side borders. Multiple rows can be designated as header rows. Once you insert a caption, it can appear in a Table of Tables. Often a table of the tables in a document is desired (similar to a Table of Contents). This can be done relatively easily in Word. Insertion of such tables in covered in the chapter on Complex Documents. It is possible to have a table act like a graphic and have text wrap around it. This is done through the Table Properties and the Positioning Button. Here are two screenshots showing the controls in Word 2003 and Word 2010. (Controls are identical.) The Word 2010 screen shot shows positioning relative to the bottom page margin. The default settings are for no text wrapping and the Table is simply inserted at the insertion point in the document. The Word 2003 screen shot has the default settings for the Table Positioning dialog. The table positioning button is not active on the Table Properties unless the text wrapping is set for "Around." I am unsure when this floating table ability was added to Word but suspect it came with Word 2002. It is not available in Word 97. Note that repeating headers in tables do not work if the table is floating rather than in the document layer. Here are some screenshots of floating tables set for text wrapping. They essentially act much like graphics in this mode. Two tables, both set to wrap. The same two tables with wrapping set, one nested inside the other. It is relatively easy to convert a table to a similar formal structure without a table. In Word 2007 and later, the command for this is found on the right side of the Table Tools Layout tab. In earlier (menu versions) of Word the commands are found under the Tables menu. The default choice is tabs which gives a traditional tabbed table rather than an Word table. It is certainly appropriate for many tables. If a table cell has text that would extend beyond the tab area, you can have something unworkable, or at least requiring more work. Converted to text using the Tabs setting it does not line up. Tabs settings for those paragraphs would need to be adjusted. That was done in the following screenshot. However, in many tables this would not be practical and one of the other dividers would be needed. Conversely, it is possible to convert text to a table. To do this, you need to select the text you want to convert. The command for this in Ribbon versions of Word is found on the Insert Tab under Table. In menu versions, it is found under Tables > Convert. It will pop up a dialog. This dialog lets you adjust the number of columns, but not rows. It lets you modify column width and pick the text separators. Note that you do not have to have everything precisely laid out for this to work. In the following screenshot, a single word in a sentence is selected. So long as you are not changing the number of columns, you get the same result as you would if you, instead, just inserted a table. The selected word(s) are inserted into a single column table and preceding and following words become their own paragraphs. So long as the marker to separate text is not found in the selected text, it does not matter which marker is chosen. Word allows you to set your own tab stops and use different kinds of tabs. However, you have to use Ctrl+Tab to generate a tab inside a table; the Tab key, by itself, will simply move you to the next cell. decimal tabs behave a bit differently inside tables than they do outside a table. If you have a decimal tab set and no other tab settings, your text will immediately align to that tab, without an actual tab character being inserted using Ctrl+Tab. Use of a decimal tab is illustrated below. Note the Ruler at the top of each screenshot. And finally, what would happen without the left tab having been set first! While the ruler can be used to tabs, once they have been set you should create a Paragraph Style to hold these settings and use that style when you want to use them again. That way, if you later change the width of your table cells and have to change the setting, you can do it in all of the cells by modifying the Style. Tabs are often better set using the Tab Setting Dialog box. The quickest way to access this dialog is to double-click on a tab in the ruler or to use the Keyboard shortcut Alt+O,T. How can I make a pleading caption in Word? There are a couple of different methods you can use to create a pleading caption in Word, but tables are one of the best ways to do this. Perform steps 1 through 5 in the "Insert a Table with Draw Table tool" in the preceding exercise. At this point the bottom left border needs fixing. Click in the left-most cell and from the Format menu, and choose Borders and Shading. Click on the diagram on the right side of the dialog box to have only a bottom border. Click OK. If you have a lengthy caption (you've probably seen some that go on for pages), you may have noticed that the scallops don't automatically copy down the center column of the table. If you don't find this acceptable, consider another way to make a caption where you use a border line separating the parties from the pleading title. Many courts now accept captions prepared this way—check your court rules to see if you can use this type of caption. See also the example pleading caption (above) using Tables. In a blank document, create a table with two columns and only one row. Remove the printing borders by clicking inside the table, and then pressing ALT+CTRL+U. Fix the bottom left border as described in step 2 in the "Make a "Scalloped" Caption Using Tables" example that preceded this exercise. While you're in the Borders and Shading dialog, turn on the printing border for the right side of the leftmost cell as well. In this type of caption, the border automatically extends as you add cross-complainants or type a long pleading title. How can I get the first row to repeat at the top of each page throughout the table? In lengthy tables such as file or pleading indices, holdings lists, and other legal documents, if a table spills onto subsequent pages you can make headings repeat at the top of each new page that contains a part of the table. 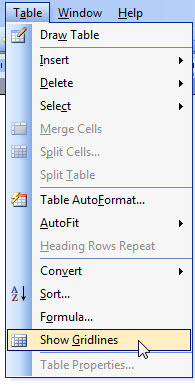 In a blank document, from the Table menu, choose Insert Table (Insert, then Table in Word 2000). Create a table with two columns and 250 rows. In the first cell of the first column, type Attorney. In the second cell of the first column, type Extension. Select the first row of your table, and then from the Table menu, choose Headings (it's called Heading Rows Repeat in Word 2000). Go to Print Preview and view your handiwork. Word also allows you to have more than one row repeat at the top of the page. Just select the rows that you want to repeat and perform step 5 above. There is no automatic way to do this. Several Word MVPs have posted the following solution, though, and it works. Put the word "continued" in the heading line on the first page. Then create a textbox or autoshape anchored outside the heading row and use it to cover the word. The shape or text box should have no border and white fill. This way, the word continued will not appear on the first page but will appear when the row (without the textbox or shape) is repeated on subsquent pages. An alternative strategy would be to put the word continued in the original row anchor an occluding shape in a non-header row to block the word on the continuation pages. Both methods are less than ideal, both work. 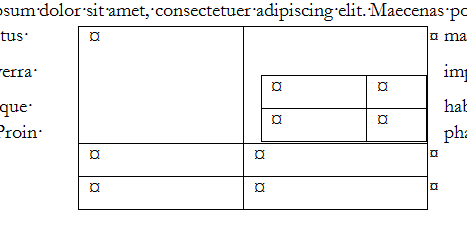 Here is an example of using a textbox anchored in the table but outside the header row. The Text Box is shown as semi-transparent for this demonstration it would be opaque in use. It can be anchored anywhere outside the header row, including outside the table itself. Note that any manipulation of the textbox is likely to move the anchor into the first row. You need to have the anchors displayed and correct for this by moving the anchor. A variation of putting an occluding shape (or frame) in the page Header is used when a page number is needed in the table itself. This takes more fiddling than having the occluding box on the first page because alignment is tricky. A page number in a Header Row will repeat the number from the first page. A page number field in a shape or TextBox in a Header/Footer will reflect the pagination used by Word in headers and footers. Here is what the continuation header (Section set to have a different-first-page header) looks like from the edit Header screen. The screenshot below is from the Print Preview screen. (In print view, the Page 2 would appear faded because it is part of the page header; in draft or normal view, it would not appear at all. When I have a lengthy entry in one of my cells, the text can break over a page. Is there a way to turn on the equivalent of "Block Protect" or "Keep Lines Together" in Word? It's possible to have it either way in Word—you can have your cells break over a page or not, depending on your preferences for the job at hand. By default, the text in a table breaks across a soft page break in both Word 97 and Word 2000. Let's explore the options in the following exercise. Create a table with 2 columns and 250 rows. Make sure you're in Page Layout view (Print Layout view in Word 2000). Go to the bottom of the first page and type in one of the cells until you see text both above and below the Soft Page Break. Make sure your cursor is anywhere in the table, and then from the Table menu, choose Cell Height and Width (Table Properties in Word 2000). In the Cell Height and Width dialog box, find the check box Allow row to break across pages. If the option is checked, the text can break over a page. If not, the row that contains the cell that broke over a page is moved to the next page in its entirety. This does not prevent cells from breaking over hard page breaks. Also, if you have more than a page of text in a cell, a soft page break must exist somewhere in that text, and the text breaks over a page even though you've cleared the checkbox in step 6. Is there an easy way to make a file index in Word? I had a macro in WordPerfect and now I've got to make them from scratch. The bad news is that you do have to make it all over again; the good news is that you'll only have to create it once. Using the power of tables together with AutoText, you'll be able to make a killer file index that you can use repeatedly. Open a blank document, and from the Table menu, choose Insert Table (Insert, then Table in Word 2000). Create a table with as many columns as you need (we'll use 4 in this example) and 2 rows. In the first cell of the first column, type "Number". In the first cell of the second column, type "Document Name". 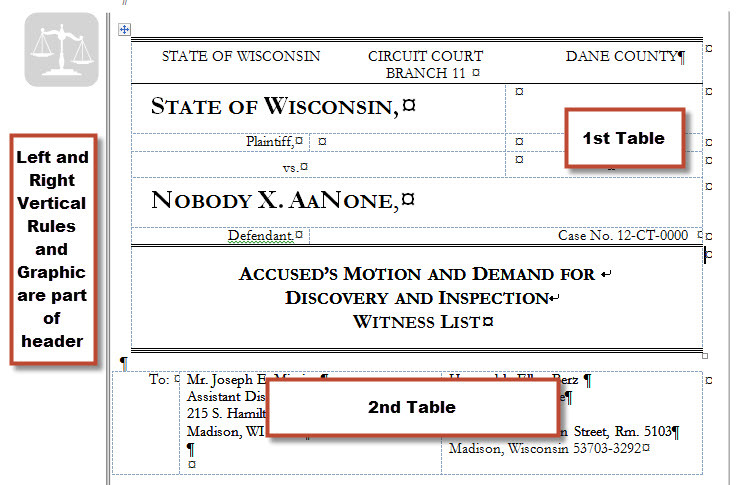 In the first cell of the third column, type "Date Filed". In the first cell of the fourth column type "Description". Click in the second cell of the first column, and then turn on numbering (On the Formatting toolbar, click the Numbering button). This will give you a numbered column down the left side. As you add rows to your table, the numbered list on the left side increments. Try it! If you save your finished product from the exercise above as an AutoText entry, you can retrieve it as many times as you like in the future. Table columns in Microsoft Word 2000 automatically resize to fit text or graphics. If you type a word that is longer than the width of the column, the column adjusts to accommodate the text. If you don't want your columns to resize when you type, click in the table, click Table Properties on the Table menu, and then click the Table tab. Click Options, and then clear the Automatically resize to fit contents check box. I am doing very simple math in my Word table. Is it possible to create subtotals? It's possible to take any value in just about any part of a Word document (it doesn't have to be in a table) and run it through any number of math functions against other values in other parts of a Word document. The way to do it is to use bookmarks. An example of how this works is shown in the next Practice exercise. In a blank document, create three separate tables with values in the first two cells of the first two tables. We're going to derive subtotals for the two tables and then a grand total of the two subtotals in the single-cell table at the bottom. Click in the third cell of each of the first two tables and click the AutoSum button at the far right side of the Tables and Borders toolbar. Select the first sum field (it should say "1500" if you've used the example above), making sure not to select the end-of-cell marker after it (it kind of looks like a spider). After selecting the first sum field in step 3, go to the Insert menu and choose Bookmark. For keyboard users, CTRL+SHIFT+F5 gets you to the Bookmark dialog box. Give the selection a bookmark name like "Table1Total". Repeat steps 3-5 for the second total ("450" if you're following the example above), calling it "Table2Total". Note Names of bookmarks in Word cannot begin with a digit, nor can they have a space in their name. Having bookmarked your totals, click in the single-cell table at the bottom. From the Table menu, choose Formula. In the top box labeled "Formula" you'll see an equal sign. Type the word "SUM", then an open parenthesis "(" and choose "Table1Total" from the Paste Bookmark drop-down list. 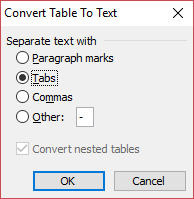 Type a comma after "Table1Total" then go to the Paste Bookmark drop-down list and choose "Table2Total". Click OK. Confirm your total is the same as what you expect it to be (in this example, "1950"). If you get a result which says "!Syntax Error,", try the exercise again, making sure that you don't select the end-of-cell marker after the number when bookmarking. I never could understand sorting in Word tables. Is it possible to sort dates and numbers as well as text? It's easy to sort dates, numbers and text in a Word table. If a simple, one-level sort is all you're after, you'll be surprised at how easy it is. All you have to do is click in a column that has a list of things you'd like to sort (like filing dates, for example) and click one of the two sort buttons near the right side of the Tables and Borders toolbar. The practice exercise below should give you an idea. Click anywhere in the column and click either one of the sort buttons at the right side of the Tables and Borders toolbar. One button sorts in Ascending order, the other in Descending order. Word automatically converts dates in many different formats behind the scenes so it can sort them correctly. Note When you use either of the Sorting buttons on the Tables and Borders toolbar, Word assumes you have a header row. If you don't, you have to sort by going to the Table menu and choosing Sort. You've probably set an exact row height that's smaller than the text you are trying to display. Click in the cell. On the Table menu, click Table Properties, and then click the Row tab. In the Row height is box, click At least. Can I insert an Excel worksheet into Word? One of the reasons Microsoft Office is so popular is how all of the programs work together. Excel is a spreadsheet program that makes number crunching, organizing and presenting data very easy — even for the mathematically challenged. To insert an Excel worksheet into a Word document, click the Insert Microsoft Excel Worksheet toolbar button on the Standard toolbar. Double-click to activate the Excel worksheet. Now you have the full functionality of Excel without leaving the Word window. In Ribbon versions, under Insert > Table, you can choose to insert an Excel spreadsheet. Note If the data already exists in an Excel spreadsheet, open the spreadsheet, select and copy the text, switch to Word, and choose paste the copied text. Word converts the data into a table format. Labels in Microsoft Word are Tables, usually set up using the Labels button on the Mailings Tab (Word 2007 and later) or the Envelope and Labels wizard or the Mailmerge wizard (Word 2004 and earlier). Once the labels are set up, you can manipulate the them using any of the techniques given here for tables. In the screenshot above, you can see the table layout with blank spacing cells that will not print on the labels. Display of gridlines is especially helpful with labels. See Graham Mayor's Insert logos /graphics on business cards and mailing labels for step-by-step instructions on inserting graphics on tables for labels and business cards. Convert the table to text and back again. Cutting the table and pasting in a new document. Save that document to RTF, close it, reopen it and save in .docx format, then copy table back to original document. Save the original document as RTF, close, reopen and save as .docx. Paul notes that some tables can only be recovered using the first method. Resize all cells in a table to be the same. Here is a short macro I developed in response to a request. (The macro recorder does not record much of table manipulation.) The measurements are in inches. Installing Macros by Graham Mayor. It is far easier to manipulate tables if you are viewing the table gridlines. It is important to realize that Word uses the term "gridlines" for two very distinct features. The first is a graphics layout gridline applied to an entire page. You do not want to be using that feature for tables! To distinguish this, to see the drawing gridlines in Word 97-2003 you would click on that button on the Drawing toolbar. In Word 2007-2019, you would click on the Gridlines button on the View menu. All of these view gridlines options are toggles - you click them once to turn the view on and again to turn it off. Notice that what appear to be single, wrapped sentences in the view without the gridlines showing are really in separate cells. These would be treated by Word as being separate paragraphs as well.